(Nanowerk News) Scientists have made exotic new materials by creating laser-induced micro-explosions in silicon, the common computer chip material (Nature Communications, "Experimental evidence of new tetragonal polymorphs of silicon formed through ultrafast laser-induced confined microexplosion"). The new technique could lead to the simple creation and manufacture of superconductors or high-efficiency solar cells and light sensors, said leader of the research, Professor Andrei Rode, from The Australian National University (ANU). "We've created two entirely new crystal arrangements, or phases, in silicon and seen indications of potentially four more," said Professor Rode, a laser physicist at the ANU Research School of Physics and Engineering (RSPE). "Theory predicts these materials could have very interesting electronic properties, such as an altered band gap, and possibly superconductivity if properly doped." 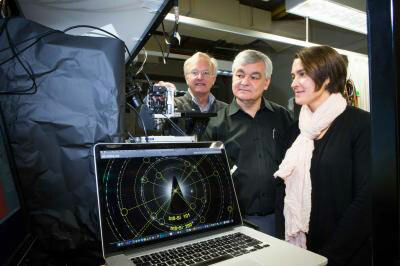 From left are: Professor Jim Williams, Professor Andrei Rode and Associate Professor Jodie Bradbury with the complex electron diffraction patterns. By focusing lasers onto silicon buried under a clear layer of silicon dioxide, the group have perfected a way to reliably blast tiny cavities in the solid silicon. This creates extremely high pressure around the explosion site and forms the new phases. The phases have complex structures, which took the team of physicists from ANU and University College London a year to understand. Using a combination of electron diffraction patterns and structure predictions, the team discovered the new materials have crystal structures that repeat every 12, 16 or 32 atoms respectively, said Professor Jim Williams, from the Electronic Material Engineering group at RSPE. "The micro-explosions change silicon's simplicity to much more complex structures, which opens up possibility for unusual and unexpected properties," he said. These complex phases are often unstable, but the small size of the structures means the materials cool very quickly and solidify before they can decay, said Professor Eugene Gamaly, also from the ANU Research School of Physics and Engineering. The new crystal structures have survived for more than a year now. "These new discoveries are not an accident, they are guided by a deep understanding of how lasers interact with matter," he said. Conventional methods for creating materials with high pressure use tiny diamond anvils to poke or squeeze materials. However, the ultra-short laser micro-explosion creates pressures many times higher than the strength of diamond crystal can produce. The team's new method promises a much cheaper and industrially-friendly method for large scale manufacturing of these exotic materials, says Dr Jodie Bradby, also from ANU Research School of Physics and Engineering. "We reliably create thousands of micron-size modified zones in normal silicon within a second," she said. "The semiconductor industry is a multi-billion dollar operation - even a small change in the position of a few silicon atoms has the potential to have a major impact."